It's a place steeped in mythology, where the most astonishing machines on Earth were tested — an area so secret that the government didn't officially acknowledge its existence until 2013. 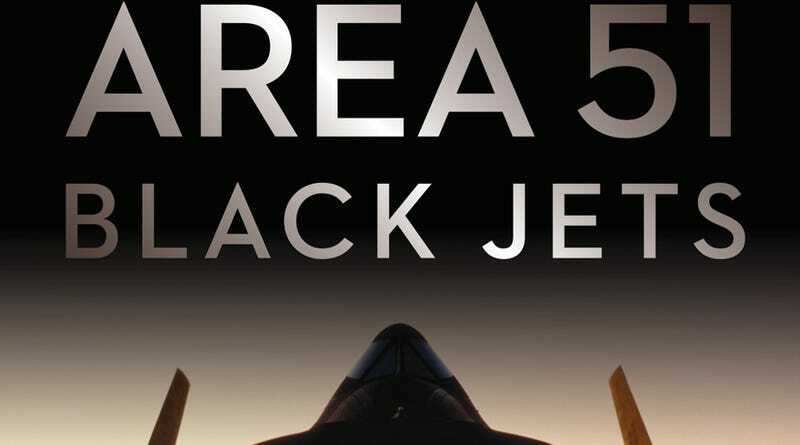 Now, Bill Yenne's book Area 51 Black Jets lifts the veil on top secret projects from the 1950s to today. Bill Yenne has written numerous books on aviation history, including several books on planes developed and tested at Area 51. Area 51 Black Jets essentially exists because of a CIA document that was declassified in 2013. The Central Intelligence Agency and Overhead Reconnaissance: The U2 and OXCART Programs, 1954 – 1974 was written in 1992 as part of the CIA's semi-classified internal official history. It had been circulated among aviation buffs for some time, but in highly redacted form. A FOIA request from the National Security Archive resulted in the release of a new version, one that reveals the location of Area 51, and that the government actually calls it Area 51. Above: A 1998 aerial photo of Groom Lake, a place which did not exist. Credit: Tony Landis photos. A broad swath of Nevada desert is carved into a patchwork of secret areas, only one of which is the actual Area 51 – a usually dry lakebed called Groom Lake and a nearby complex of hangars and runways. Yenne covers the history of the entire region, from its creation as a gunnery range and use in atomic bomb tests, through the Cold War, the 80s and 90s when it became a mythological Mecca for UFO enthusiasts, through its probable use today as a test site for the most advanced military drone aircraft. On a blustery day in April 1955, Clarence "Kelly" Johnson of the Lockheed Corporation stepped out of an airplane and felt the crunch of Nevada desert gravel beneath his feet. The cold of winter had long passed, and the oppressive, oven-like heat of summer had not yet enveloped the place. He looked around at the barren peaks of the Pahranagat Range to the east, the Groom Range to the north, Pahute Mesa to the west, and an endless stark nothingness to the south. Aside from the men traveling with him, nothing moved. There was no sound but that of the breeze in the Joshua trees. He was in the middle of nowhere, and nothing could have pleased him more. It was, he knew, the perfect place to test an airplane that was so secret that nearly no one at Lockheed, other than those directly involved, would even know about it until well after it started to fly. Groom Lake was the one of a number of sites that Johnson and his team had investigated as a possible testing location for their mystery ship. In November 1954, Johnson had sent Lockheed test pilot Tony LeVier and manufacturing foreman Dorsey Kammerer out to scour the entire desert Southwest for a remote location where an undisclosed "black" airplane could be tested without being seen. Even the site search was shrouded in secrecy. LeVier and Kammerer took off in a Beechcraft Bonanza telling everyone that they were going on a hunting trip. They were misleading only in their explanation of the quarry that they were hunting. As Johnson later wrote in his memoirs, the Groom Lake site had come as a suggestion by US Air Force Colonel Osmond J. "Ozzie" Ritland, who had once worked there during early nuclear testing. Beginning in 1950, Ritland had organized and commanded the 4925th Test Group (Atomic), which had been the unit responsible for the air-dropped nuclear weapons tested at the NTS. Ritland knew the Nevada desert well—and of a place then called Watertown landing strip at Groom Lake. Lockheed's "customer" for this still-notional airplane had already promised to make arrangements to acquire this place as a test site, pending Johnson's personal inspection and his thumbs-up on its suitability. The customer was the Central Intelligence Agency (CIA) in the person of the man who would be the CIA program manager for this project, Richard Mervin Bissell, Jr., a Yale-educated economist and protégé of high profile diplomatic troubleshooter and one-time ambassador to the Soviet Union, Averell Harriman. Bissell had run covert special operations for the Office of Strategic Services (OSS) during World War II and had recently been recruited into the CIA, where he helped engineer a coup in Guatemala early in 1954. He was now serving as special assistant for planning and coordination to Director of Central Intelligence (DCI) Allan Dulles. "One of our first tasks was to find a base from which to operate," writes Johnson in his memoirs. "The Air Force and CIA did not want the airplane flown from Edwards AFB or our Palmdale plant in the Mojave Desert. So we surveyed a lot of territory. There are many dry lakes in and around Nevada, and the lakebeds are generally quite hard, even under water in the rainy season. A site near the nuclear proving grounds seemed ideal, and Bissell was able to secure a presidential action adding the area to the Atomic Energy Commission's territory to insure complete security." "Kammerer and I flew to what would be the test base," Johnson recalls. "I had an Air Force compass, and he had some surveying equipment for use on the ground. Kicking away some of the empty .50-caliber shell cases and other remnants of target practice we laid out the direction of our first runway. A road had to be laid out, hangars constructed, office and living accommodations built, and other facilities provided." This is how the middle of nowhere became the nexus of black airplane development in the United States. Just as the place later became iconic, the man who started it on that road was already an icon.Like any book on military history, there are sections that feel like alphabet soup. The military does love their acronyms. At times, Yenne delves a bit too laboriously into the operational history of an aircraft once it left Area 51. The chapter on the U2, for instance, drags on more than seems necessary. But these minor flaws only slightly mar an otherwise fascinating book. Even if you're familiar with the SR-71, F-117, and other top secret aircraft, you will almost certainly find new stories of daring test pilots, astonishing speed records, and technology that feels 30 years ahead of its time. This book unavoidably becomes something of a tribute to Kelly Johnson, a man whose innate grasp of aeronautics seemed to allow him to turn back-of-a-napkin design sketches into functional aircraft at the upper limits of technological performance in the span of months. A great deal of what happened at Area 51 during the Cold War was driven by Johnson's vision and skill, not to mention his ability to make extremely convincing arguments to government bureaucrats. Image credit: CIA. Even as someone who reads a fair amount about aviation history (though I'm by no means any kind of expert), I found quite a few things in this book I'd never known about before. The best example is Tagboard, a 1960s project to launch a reconnaissance drone from the back of the A-12 (the precursor to the SR-71) while flying at Mach 3. An early test resulted in the loss of an A-12 and the death of co-pilot Ray Torick. Above: A D-21 Tagboard drone attached to the M-21 Mothership, the last aircraft in the A-12 lineage, circa 1965. Credit: Tony Landis Collection. Yenne only touches on alien conspiracy theories, acknowledging the cultural phenomenon that Area 51 became in the late 20th century. In all the evidence, declassified documents, and clandestine photographs, there isn't a hint of proof that anything otherworldly has ever been stored, studied, or flown at Groom Lake. And really, the feats of engineering and piloting accomplished by the terrestrials in Area 51 are astonishing enough. No aliens required. Even so, the final chapter explores the mystique of the place, as Yenne describes the drive along a long, straight, unmarked gravel road until you reach those famous signs, which no longer threaten lethal force. He meets some of the locals who run kitschy diners catering to alien and aviation buffs alike. And yet…there's still an aura of mystery, despite all the declassifications. There are things that were designed and flown from Groom Lake that we knew nothing of until later, when they were declassified. The Northrop Tacit Blue was a bizarre aircraft (a "flying milk carton" by one description) that flew for several years with no one knowing about it. If it hadn't been declassified, we'd still know nothing about it. Reports of strangely shaped aircraft, or of F-117s still being flown after they were officially retired, force you to wonder what amazing things happened at Area 51 that we don't know about. And if you're a firm believer in space aliens, then throw that in, too. There's only so much to be learned from examining federal budgets and satellite photos. Above: A YF-117A peeks from its heavily-guarded hangar at Tonopah. Credit: Lockheed. This means that the later chapters become highly speculative. Drones, Auroras, Black Mantas and other weird planes may or may not exist, and may or may not be flown out of Groom Lake. These chapters are about as good as they can be, considering Yenne is trying to write about things we don't know about. Still, I preferred the more concrete Cold War history of the area. Speaking of photos, Area 51 Black Jets is stunningly illustrated. As you look at photos of advanced aircraft or aerial shots of Groom Lake, you can't help but consider that possessing these same photos 20 years ago would have been treasonous, or at least a severe breach of national security. Now you can see F-117s being built, A-12s being pole-tested for their radar signatures, and examine the dry lake, runway and hangars that make up Area 51. Above: Three SR-71 Blackbirds take shape on the factory floor at Lockheed's top secret Burbank Plant B-6 in the late 1960s. Credit: Lockheed. A great deal of Area 51 Black Jets' subject matter remains classified. As such, you won't find interviews with test pilots or aircraft designers. Yenne draws from as many primary sources as possible, like declassified budget documents, memorandums from Air Force officials to Lockheed executives, and technical papers and patents. These and his numerous secondary sources appear in a thorough bibliography, a must for any historical work. If you're an aviation buff, you'll find Area 51 Black Jets a comprehensive history of top secret projects. If you're a UFO buff, you may find this book a bit frustrating, but it does provide a solid background on the documented history of a mysterious place. I find myself thumbing through the pages even after I've read it simply for the photos.